A total of 351 people sent valid responses by our 5pm PST deadline, and we again picked a random respondent to receive a thank-you gift in the form of an iPhone case. 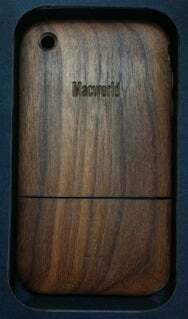 The recipient this time was livbem, who will be receiving a handmade, Macworld-logo iWood iPhone 3G case from Miniot. What was livbem’s answer? He has 165 apps in iTunes. I’ll again point out that these surveys aren’t scientific; they’re just fun snapshots of the iPhone use of some of Macworld’s Twitter followers. With that caveat in mind, here’s a quick look at the breakdown of the responses. Keep in mind that these responses represent the number of iPhone apps in iTunes, which is not necessarily—in fact, it’s unlikely to be—the same number installed on a person’s iPhone. After all, many of us have purchased, or downloaded for free, an app and subsequently deleted it from the iPhone because we were underwhelmed; few of us take the time to delete those unwanted apps from iTunes. These numbers also don’t represent purchases, as they include free downloads. When it comes to our 351 survey respondents, only 28 (8 percent) have downloaded 25 or fewer apps. The majority of people (53 percent) have downloaded more than 25 but fewer than 101 apps—a result that seems reasonable to me. 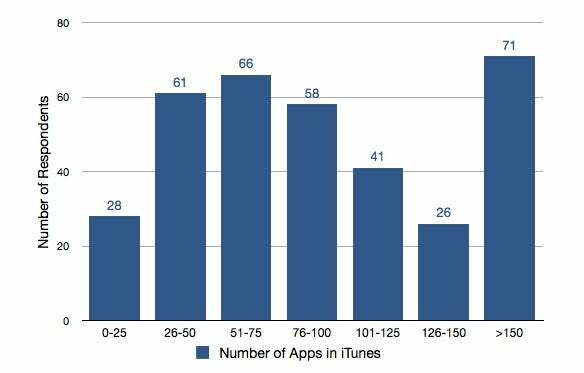 On the other hand, I found it fascinating how many of our respondents—71, which is just over 20 percent—reported having over 150 apps in iTunes. If I had more time, I would have liked to match these responses with the responses to Tuesday's question (the number of apps on the iPhone) for everyone who answered both—I'm curious to see, for each person, what percentage of downloaded apps are actually installed. The lowest number submitted was, surprisingly, zero—and it was submitted by four different people. Clearly, these individuals haven’t been impressed by the iPhone’s thriving app market. At the other end of the spectrum, reader ryan10ad reported a jaw-dropping 1759 apps in iTunes—and that wasn’t even the highest number! That honor goes to PeterApokotos, with a flabbergasting 2259 apps. Don’t believe it? He posted a screenshot. AkeManga commented that with 528 apps in iTunes, the Applications view is essentially unscrollable. (Is that a word? It should be.) And I believe it: with 652 apps in iTunes on my own Mac, I find the Applications view to be nearly useless. Maybe that’s why I don’t go in and delete old, unwanted apps? If you’d like to participate in the rest of our surveys this week, you can follow @macworld on Twitter and respond to our morning question each day. We’ll be randomly picking another (US-resident) respondent each day to receive a case.